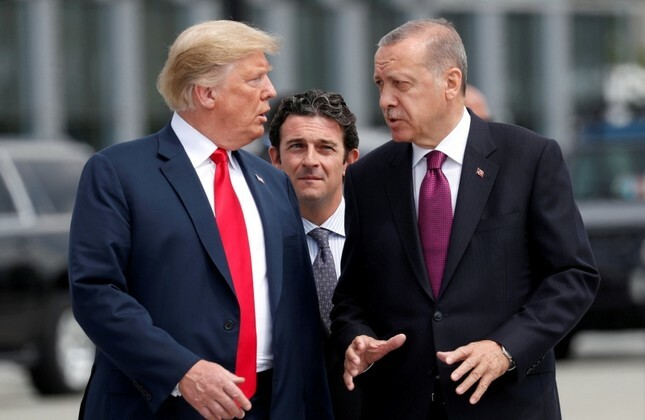 A preliminary understanding was reached between Turkey and U.S. over sanctions and Turkish delegation will visit Washington within two days, diplomatic sources said Tuesday. The two countries have reached consensus to agreed to continue face-to-face meeting, sources added. Both U.S. and Turkish officials have reiterated their willingness to develop diplomatic relations and resolve problems, further expressing mutual appreciation for upholding diplomatic dialogue and constructive attitude. The relations between the two NATO allies deteriorated to an unprecedented extent after Washington decided to impose sanctions on Interior Minister Süleyman Soylu and Justice Minister Abdulhamit Gül over the detention of terror-linked pastor Andrew Brunson, Ankara called on their counterparts in the U.S. to come to their senses as they deemed it illogical and have been trying to solve the matter through diplomatic channels. Following the U.S. sanctions, President Recep Tayyip Erdoğan announced that Turkey has decided to freeze the assets of the U.S. justice and interior secretaries in Turkey as a retaliation. Turkey's top diplomat Mevlüt Çavuşoğlu said several times that Turkey wants to resolve issues with its ally. Çavuşoğlu had a meeting with his American counterpart Mike Pompeo in Singapore on the sidelines of the ASEAN summit, which he described as "constructive." "There might be problems between our countries and there will also be dissidence. However, Turkey always wishes to resolve these issues via diplomacy, dialogue and mutual understanding," Çavuşoğlu told reporters after meeting his meeting. "Since the beginning we have said that a solution cannot be reached by using threatening language and sanctions," the minister added.